The very first course of the exchange program i.e. 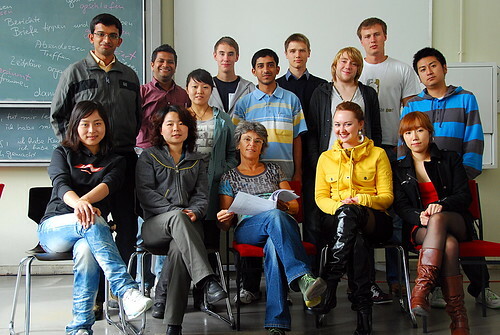 German Language course at ESB has been an amusing experience and very different regular MBA courses. Unfortunately, the course came to an end today, wish it was there for a longer time ! Anyways, the memories of the course, will be cherished by us for lifelong. Initially, we were a bit apprehensive to take up the course and then our ESB co-ordinators made it mandatory to attend it. The course started with a surprise test on german language skills, which was used to partition candidates among expertise. The bouncer on the first day further dampened our low-enthusiasm to learn the language. But, the equations changed when the actual classes started. The main factor was nice innovative pedagogies used by our faculty Toni Stoiber. She started from basics of what's your name, where are you from etc ... and then changed gears and taught us a German song, the emphasis was given on learning by feeling. The fun part of the sessions were Thomas and Juta sequences. Have a look at the video in which my bactchmate Sachin(as Thomas) is delivering german dialogues to Yunyu(as Juta)! Today, the last class of the course, was concluded with a "Oktober fest" song Alles Gute. In order to develop vocabulary of the language, Toni conducted many interesting games which were essentially like musical chair. For example one, two, three in German got embedded in our brain in a giffy. The other distinct feature of the course was the diversity. Myself, Sachin & Sameer from India. Luke and Tom from U.K.
Ilya, Natasha and Egor from Russia. It was not only language course there were several other activities. Tübingen City Tour and Boat Ride. Due to some other priorities I could take part in some acitivities, but blog post on the rest next time ! Why this course is needed? Thomas, yeah, it's true that it will be a life-long memory for us to members in such a helpful and happy group with kind Tony. It's a pity that our“Thomas and Juta”is lost, however, it will be a foever viedo in our mind.